It’s rare that I find something related to Page County in the Civil War in another blog, so when I do, I’m obviously interested. Right away, I recognized that the image of Harrison Monroe Strickler in Scott Mingus’ recent post originated in this reunion photo from 1894. My gggg-granduncle, Howard Richards, also appears in it, in the back row, ninth from the left. Some might recall that I mentioned him in my Confederate ancestor analysis of Joseph Richards in September 2009. Beginning with the rear rank and continuing from left to right: George Alva Goyer, William H. Rodgers, Middleton Warfield Yates, George Henderson (Co. B), John Pendleton Grove, Jacob James Dallas Slusher, Jacob C. Kibler, Daniel Kemp, Howard Richards (Co. A), James H. Shenk (Co. D, 7th Va. Cav. ), John Robert McCullough, Philip Monroe Kauffman, John W. Grove, James Booton Compton, Joseph C. Ambrose (Co. C), Milton Bowman, Joseph M. Huffman, Franklin Clem, Captain John H. Grabill, Lieutenant Harrison Monroe Strickler, Charles Bailey Fristoe, Milton N. Rhodes, Isaac Newton Jennings (Co. A & D), Samuel B. Bowman, ____ Hutchinson (Co. A), Andrew Jackson Brumback, Joel Moreland, Samuel C. Golladay, John P. Mauck, _______ Rudaciller, James W. Thomas Warren, William Edwin Grayson, John Henry Flinn, Ira C. Bumgardner, William T. Kibler, _______ Rudaciller. Company E had members from both Page & Shenandoah County, Virginia. The original of this photo was presented to 1st Lt. Arthur Ashby Grove by his father John W. Grove who was a member of Co. E, 35th Bttn. Va. Cav. The original photo that I was able to get this scan from had the following inscribed on the back: “This Battn. was commonly called White’s Battn. and was commanded by Lt. Col. Elijah V. White an excellent officer and gallant soldier and was frequently in history as ‘White’s Comanches. '”This particular photo was also one that was given to Lt. Arthur Ashby Grove by his father, John W. Grove, who was a member of the company. As a sidebar (and related to my WWI interests that I have been mentioning here lately), Lt. A.A. Grove later served in the 116th Infantry, 29th Division, during World War I. It should also be noted that Col. White, at the time of the event a minister of the Old School Baptist church, “delighted many” of the Broad Street Baptist Church with an “able and eloquent sermon” on the evening of the first day of the reunion. The reunion of this celebrated and well remembered command, the first since the war, was held in Luray on the 2d and 3, and was the occasion of drawing together one of the largest assemblies seen here lately. On the first day, Capt. [Richard S.] Parks, one of the brave soldiers of the old 10th [Virginia Infantry], gave an interesting address, and with his well known eloquence added much to the success of the day. The Elder John K. Booton, one of the first of the Page boys to go out in ’61, offered a fervent and appropriate prayer. Its commander, Col. White, the intrepid leader of these brave boys, was present, and of course made a speech. The Colonel surprised his many old friends here by his youthful and unbroken appearance, and though thirty years have passed since he quit the saddle, yet to-day he looks the man he did when at the head of his little column he roamed these hills and valleys as one of the eyes of the army of Lee. With him too was the earnest and impetuous [Frances/Frank] Kilgour, so well remembered by the boys of the battalion, and who for many years had been fighting that enemy of the human race, King Alcohol, and whose voice of eloquence and of appeal has been heard in every village and hamlet of the State. The Major is not a young man any more, but for earnest, vigorous and determined effort he is this day a soldier still, and the good he yet will do for the case of temperance will only be measured by time. Then, too, Strickler, the Adjutant, and Grabill, one of the Captains of this little band, were present, and both related some incident that recalled the past, and made interesting speeches. The two-days were spent in the woods near town, and so good was the arrangement and perfect the accommodations that the crowd, large as it was, not only had the occasion to enjoy, but did enjoy it. White’s Battalion was one of the best cavalry commands in the service, and its record embraces some part in all the battles of the late war. As remarked by its Colonel in his speech, it can be said of it what perhaps cannot be said of any other command – it always succeeded in its charges to break through what was charged; and altho’ many times it had afterwards to give back and retreat, yet it never did so until it had gone through the thing charged. This is certainly a great record for any command to bear, and from it the young men of this day may know what it was to be a soldier and what was expected of them. This reunion will long be remembered by the members present as the first, and to many, perhaps the last for them, and though meeting but once yet the pleasures of that will always be recalled and remain a joy and gladness. It was indeed a time of reunion – a happy, joyous one, only embittered by the redirection that year by year, some of those who were here will pass away, and before another thirty years passes away all will have been called to answer the last roll call and to join the great majority across the river of time. Thanks so much for posting this! I am currently writing an historical fiction account of the 35th VA during the Gettysburg Campaign, focusing on Harrison Strickler and Frank Myers as the lead characters. Any and all info, no matter how “trivial,” would be reviewed with the greatest of interest! The gentleman, 6th from the left – in the rear rank. His name was not “Jacob”, but “James” Dallas Slusher. I know, because he was my Great Great Great Great Grandfather. He is burried in Luray, Va in the old Shank’s cemetery. Does anyone have any other photos of him? I’m afraid I don’t know of any other photos for him. Hi how much info do you want on jacob kibler? His family came from germany I would have to check the dates on that. The story I got was the name got misspelled at there arrival and the kiblers settled in VA.and the others spelled keebler settled in PA.
That seems to ring a bell. Need to go back and check some info in my resource pool. That whole affair is one of my favorite stories. I’ve seen this photo before, but it’s great to get more information on the 35th. My great-grandfather, Albert Bowers rode ‘boot to boot’ with H. M. Strickler into the town of Gettysburg. Alas, he apparently didn’t make it to the reunion. If anyone has any information on Albert Bowers, I would love to hear from you. my gggg grandfather was Jacob Rudacille. his brother phillip has a stuue of him as the oldest confederate soldier In Front Royal, Va. If any one has information on Jacob and his family Please ,please send me a reply! My GG Grandfather is Jacob Franklin Rudacille (1836-1904). As a new member of Ancestry.com, I have learned only today that he and his brothers John, Thomas and Philip all served in Company E, 35th Virginia Cavalry Battalion. The youngest brother (William) was 14 when the war began and stayed behind to run the family farm. I am primarily interested in the military records of all four brothers and plan to acquire a copy of the history of the 35th. Fascinating post! May I have your permission to repost this on our Facebook Page? Thanks. Yes, you may repost. Mr. John Windle…my GG grandfather is Albert Bowers (through daughter Minnie). Love reading about the 35th. Cousin Robert Stebbin. . .Do you have any information on Albert Bowers? My grandmother was his daughter, Rose Lydia Bowers. Rose and Lydia’s mother was Susanna McInturff. I believe that her sister, also Lydia, married Samuel Golladay pictured here. Hello, I am a student and I am doing some research for a Civil War Museum. We have an artifact of a belt buckle form John Pendleton Grove. I was wondering if you had any information on him and maybe even where he was buried at. Thank you! I know of nothing that indicates any service with a La. unit. Prior to his service in Co. E, 35th Bttn. Va. Cav., he served in Co. K, 97th Virginia Militia (though even while with the militia, he was on detached duty at “Junction”, as a teamster). Of course, the militia was disbanded Jackson in the spring of 1862, and Grove enlisted in the 35th in July, 1862. Of course, there is the off chance that he may have acquired the buckle in the spring of 1862, when the Taylor’s Louisianans were briefly in Page County, or even in his participation in postwar Confederate veteran activities. Grove is buried in Green Hill Cemetery in Luray. John Pendleton Grove was my great-great grandfather. He is erroneously identified in the picture posted. I have many pictures of him. He lived outside Luray, Va. on my family’s farm. My mom owns the house he lived in. My GGGrandfather. I have pics and info. 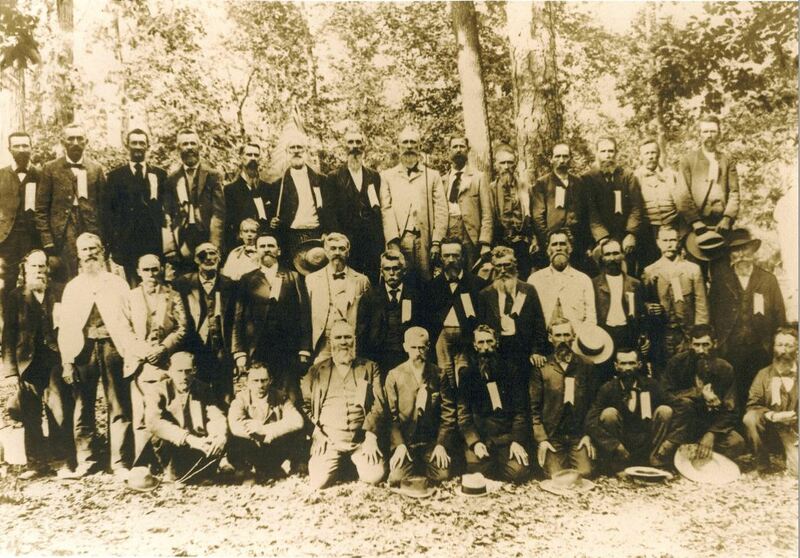 Back row fifth from left is John William Grove and seventh from left is John Pendleton Grove, my great-great-great uncle and great-great grandfather, respectively. I have many original pictures of them and both were from Luray, Va. The man on the back row fifth from left is John William Grove and seventh from left is John Pendleton Grove. They are my great-great-great uncle and my great-great grandfather respectively. I have many original pictures of both of them. They were both from Luray, Va. I am the eighth generation to live on the Groveton Tract, an original, 1756 land grant, south of Luray. Looking for any information on James William Curry of Company E, especially where he may be buried. Hello! Thank you so much for posting this. Charles Bailey Fristoe is my distant cousin. When you scanned the photo, did you by chance do a high resolution scan that you would be willing to share? I can post / send my email if so. I would love to be able to pull him out of the group and enlarge his image for printing. Thank you so very much. Anyone has any more info, please lmk.